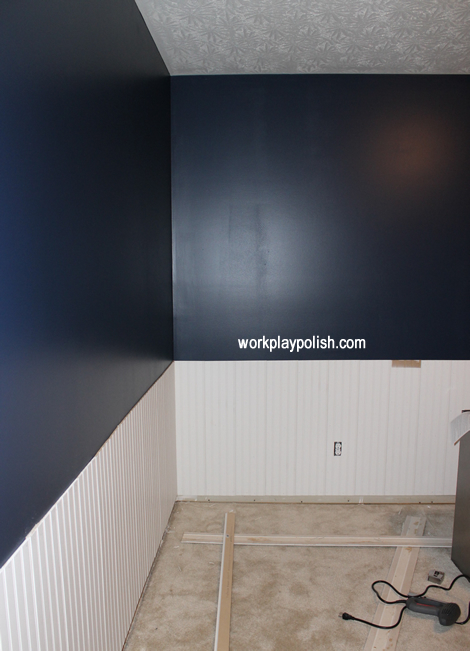 This past week, Mr. Workplaypolish and I started to install wainscoting around the perimeter of The Mani Cave (well, really HE started installing it and I popped in occasionally to tell him how awesome it looked). It may not seem like we got much done, but really we are light years ahead of where I thought we'd be (notice the use of the term "we"...I've officially declared this a family project). 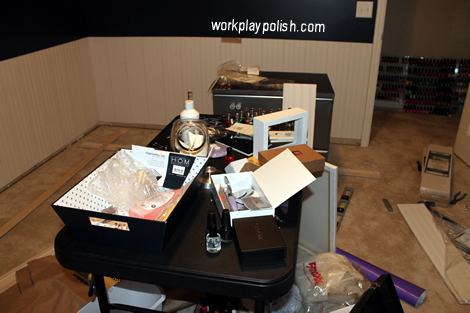 Before I show you our progress...here's a shot of The Mani Cave carnage I've got going on right now. If you know me, then you know that this mess makes my head spin around on my shoulders! So...ta da! Below is a photo of the hubby's handiwork. We don't have the trim up yet. We're going to reinstall the six inch baseboard. For the chair rail, we bought special trim that has a lip which rests on the wainscoting. I love how the white looks against the navy! 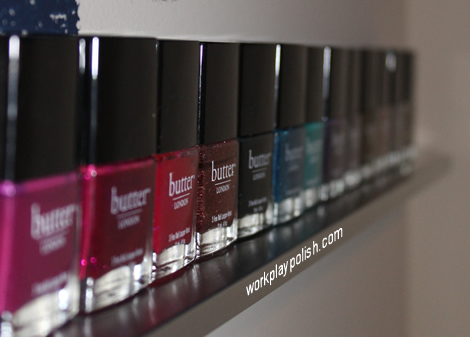 And here is an intentionally vague shot of my polish shelving experiment. We attached the secret contraption to the wall in a place that will be covered up later anyway. I piled on the guinea pigs (Butter LONDONs...sorry guys) and we've been slamming doors and jumping and using the nail gun (not all at once, of course) to see if the polish falls off the shelf. So far, so good. But more on that in a later post. I've also started looking at accessories. I love this signage. I think I'm going to order a canvas print of it with navy letters instead of black. And of course I'll find a place for my shadow box containing my mother's vintage Zoya polish. If you don't know the story about the polish...you can read about the mystery here and about the Zoya Fairies solving the mystery here. So in the coming week, I hope to complete the wainscoting task (fill in nail holes, sand, paint). There are not enough hours in the day! !